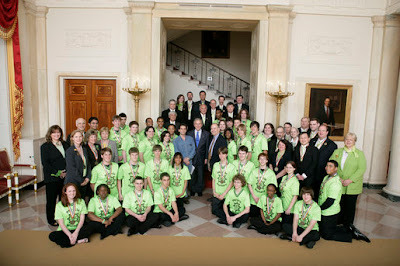 Delaware's FIRST team met with President Bush today at the White House! The Miracle Workerz, or MOE, which stands for Miracles of Engineering, is the Delaware-based team sponsored by DuPont. This year's team includes students from fourteen Delaware schools, two Pennsylvania schools and from homeschools, too. Dean Kamen of Segway fame founded FIRST, "For Inspiration and Recognition of Science and Technology", as a way to mentor young people in science and technology and to reward them in much the way our young athletes are. With the assistance of their mentors, teenagers learn how to engineer and build a robot to compete against other robots in specially designed games each year. Some students have won scholarships to top universities due to their experiences with FIRST. Always competing in their flourescent green tee shirts, the MOE team has had many successes since it was established in 2000. This year MOE won the FIRST Robotics Chairman's Award, the highest honor in FIRST Robotics. And they got to meet the President of the United States. Not too shabby. My first thought was to the family I know whose son currently attends Virginia Tech. Virginia Tech is a big school. Statistically, he was most likely safe. On the other hand, there were thirty some families who had lost loved ones. I didn't have their phone number so I called the mother's best friend who would surely have information. He was safe. Still, I shuddered, and I shed some tears for the unknown families who were experiencing the worst nightmare of their lives, knowing they would never wake up to find it was only a dream. The media did broadcast stories on the victims. They also shared stories of the heroes of the day. A professor sacrificing himself so his young charges could live. Young men barricading the door to protect themselves and the others in the room from the insanity without. None of us know how we would react in such unanticipated situations; it's reassuring that some will shine. While the media's attention to the victims and the heroes of the day is right and proper, their broadcasting of Cho's videos and their obsessive focus on who he was, what he did, and how he did it, seem counterproductive and downright dangerous. We normal people are horrified and disgusted by his distorted views and his acts of violence against and murder of innocent people. We are repelled by his obviously twisted and insane mind. I fear, however, that there is a small segment of the population who might see him as a hero of sorts and find his notoriety attractive enough to play copy-cat, to go out in a blaze of glory themselves. It's really not that difficult a concept. When my children were very young and had the tendency to hit and hurt each other, as children are wont to do, I made a point of lavishing attention on the injured child. Yes, the offender needed to be dealt with---and was-- but the important truth I wanted to impress upon them was that Mom's attention would not be won by being mean or destructive. That tactic has worked well in our home to extinguish negative attention getting behavior. Perhaps the media could learn from such simple parenting techniques? Are they really giving us news by obsessing over the who and why of this obviously sick individual? Or are they inadvertently feeding the hunger for attention the whack-jobs of the world feel by showing them that if they are evil enough they'll get their fifteen minutes of fame even if it is post-mortem? Next, the blame game really bugged me. We're understandably uncomfortable with the notion that we really can't control everything, that life is unsafe, and that we really are mortal. We want someone in authority to be able to protect us and to have all the answers. It's just too unsettling when they can't and don't. Virginia Tech faced the unthinkable. Just how were they to respond to such an event that no one there had imagined happening on their campus? Could they possibly keep everyone safe all the time? How many of us would know what to do if something like that happened at our places of employment or a store or restaurant that we frequent? On the other hand, it is possible that some decisions made long before were counterproductive. In the weeks to come, policies in place should be re-examined to judge their efficacy. Not to condemn those in charge, but to learn. For example, Virginia Tech decided that all would be safer if they forbade guns on campus. But how true was this belief? Those bent on harming the innocent tend to choose easy targets. In this case, the gunman could be reasonably sure that everyone else around him was obeying the gun-free rules that he alone disregarded. He knew that if he were armed and they weren't, he would meet with little resistance. I question Virginia Tech's decision to forbid those with license to carry to bring their firearms on campus. It may not have stopped him from killing, but it might have stopped his rampage sooner. This isn't a plea for everyone to be armed, of course. Not many people actually have to exercise their right to bear arms to deter criminals. But if criminals know that they're the only ones armed because they're the only ones deliberately flouting the laws, they'll take advantage of the situation. Perhaps our society would be better off if no one had guns. I'm not completely sure that's the case, mind you, because smaller weaker people can gain equal footing with larger stronger ones through the use of firearms, but for argument's sake, maybe we would all be better off if there were no guns, period. I honestly don't think that would stop a Cho. He was criminally insane and bent on self and mass destruction. What would stop him from being a suicide bomber? Or committing arson? Or performing any number of other acts of violence? Another thing it seems we need to make decisions about is the balance between individual liberty and public safety. At one time, the mentally ill were treated abominably. Now we try to respect their freedom and rights as human beings. At what point do we say "You look like you might become a danger someday, so even though you haven't committed any crimes, we're going to put you away"? This is not such an easy question to answer. Let's not forget that hindsight is 20/20. Even most mentally ill people don't create such carnage. Maybe Virginia Tech should have expelled him, at least. That, however, might have been difficult as Virginia state law, if I understand it correctly, forbids expelling the mentally ill. Yet even if they had expelled him, what would have stopped him from coming back later to massacre students and faculty? Or what would have stopped him from taking his anger elsewhere and shooting up another segment of society? In the end, life is uncertain and we can't control all the variables. We try, certainly, and we should always consider ways to lessen the chances of bad things happening and to protect innocent life. But sometimes we just can't. We're not that powerful. For now, the nation will grieve for the victims, their families and their friends. Life cut short so horribly is heart-rending; the hole left in the hearts of those who knew and loved them may never be filled.